Mike Myler -game designer and writer- was kind enough to take the time to be interviewed about his work, Pathfinder, and living a creative life. I’m a full-time freelance author and game designer that creates all kinds of content (taking particular delight in world building). A few years ago I started writing material for several different companies and as the years progressed, worked extremely hard to develop my own intellectual properties in the background. At this point the situation is starting to reverse (commanding three product lines) and now world-building is emerging as the focus of my career—which I’m starting to suspect was an inevitability. What systems do you play/make for? Or is your work agnostic of system? I designed N.O.W. for the What’s O.L.D. is N.E.W. RPG from EN Publishing, but most of my work is on Pathinder RPG Products and Dungeons & Dragons 5th Edition. 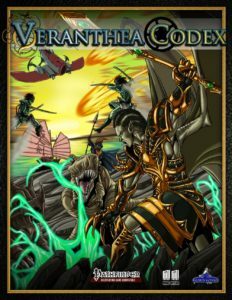 Hypercorps 2099 straddles that divide (with a book for each system), but Veranthea Codex is very much Pathfinder and Mists of Akuma is certainly rooted in 5E. Expanding my worlds to other systems (and indeed, designing other systems) are projects that are on the way but my magnum opus of game design is still in the kiln. My fiction writing is system agnostic though and anyone can enjoy the cyberpunk thrills in An Undying Contract! My first game was when I was a wee little one (I think 9 years of age), but I don’t remember it well. Then in highschool I GM’d a few Dungeons & Dragons 3E games for my friends (disastrously trying to woo one of them) before joining a proper group run by my closest buddy’s brother in their garage. That became an epic campaign that lasted until (and I think after) I went off to college, and following a brief break from the hobby where I was busy being a ruffian rugby wing, got back into gaming with Pathfinder. 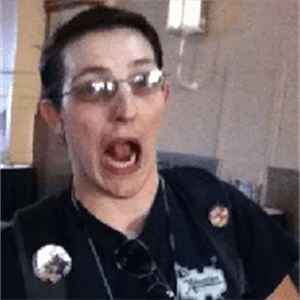 Veranthea began in a dilapidated squatter house in Pittsburgh’s Uptown before I met my fiancee and it was her that got me into this professionally—Stephanie prompted me to start selling my adventures and since then telling stories through RPGs has become an obsession. Terry Gilliam stands out in my mind. The Adventures of Baron von Munchausen is a truly phenomenal film (and a favorite RPG! Look it up!) and it drove me towards storytelling; one of my favorite papers in my Film Studies courses at college was focused on him making the first animated depiction of god in Monty Python and the Holy Grail. More recently I’ve been gripped by Warhammer 40,000—something about the dystopian space opera and the intrigue of a future where there is only war is deeply compelling to me. Aside from those I’ve always been a big fan of comics (The Question is my favorite superhero and Doctor Doom is my favorite supervillain; the Doom 2099 comics are amazing and not to be forgotten) and fantasy in general (long ago I read Xanth books and loved them). Today most of my inspiration comes from Stephanie (she is my muse) and what little bit of leisure I get (usually spent reading a space marines novel or occasionally playing a video game). Also, as shoutout here for Sean K. Reynolds: were it not for The New Argonauts (which is FREE and AWESOME) I may not have made it back onto this path. I’ve really been enjoying a Demolished Ones (a FATE game) and I can’t stop reading a Dan Abnett novel after I start. Honestly I don’t get a lot of time to enjoy other folks’ works (either in leisure or gaming, as I always have several different things that need playtesting) and I genuinely miss the exposure. Getting that corrected is fairly high on my list of priorities. Interesting things are happening; in terms of the industry very generally we’re watching digital tools decentralize everything. While on the whole this is good for the hobby, gaming shops are getting rocked by things like Kickstarter and Roll20 all while more people are gaining an interest in boardgaming and RPGs. If you are a member of the gaming industry or want to be our good buddy, please encourage folks to make connections and buy products at their friendly local gaming stores—we need them more than you realize! Many a gaming group has been born at the tables of an FLGS and I know I wouldn’t be writing this right now if it weren’t for old Blind Phil down at Gamemasters. In more specific terms, I’ve recently been thinking about the 5E market and while I have one more project to put out there for it and two lines to continue supporting (I’m a strong believer in follow through so don’t expect any of my ships to veer off course), I think that we’re going to watch Pathfinder pull through in the end. The DM’s Guild has done very strange things to 5E and while in the short term I believe it’s operating generally how Wizards (or more accurately, Hasbro) wanted it to (avoiding a widespread market bloat that ultimately dilutes their core product line), it’s cutting out the bottom from proper third party publisher support (also something I think they considered). We’re about to talk about Kickstarters in the next question and they’re a perfect example of what I’m driving at: Mists of Akuma funded within the expectations of my previous projects, but take a gander at something from a much bigger publisher (Green Ronin) and look at how that (Book of the Righteous) struggled to fund and you’ll see what I’m driving at. Normally these folks net boatloads of money to produce material (double or triple what they got for BoR) and if you look at 5E Kickstarters from before the DM’s Guild rollout you’ll see more supported projects. My working theory is that the rush for people to be seen by Wizards designers on DM’s Guild (notice me senpai!) has driven down the pricing in that exclusive market so low that there’s no incentive for experienced and reputable publishers to make material. I’m sure there’s good stuff on there but when I went to go find it for folks to work on Mists of Akuma, sorting through all the many products (all of which enjoy a much more responsive user base with feedback and reviews galore) for the best material was practically impossible. Worse yet, it creates ridiculous pricing expectations for customers when they go looking for 5E material outside of that distribution channel. We’ll see how things play out but it’s making me want to put more of my eggs in the Pathfinder basket—Paizo also has forums and proper support for their products, something that WotC has dropped or relegated entirely to Facebook groups (I cannot get over that! What are you doing?!!?). 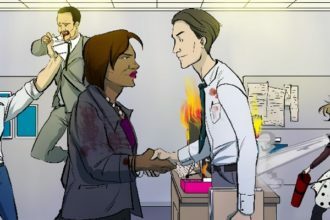 You’ve now run three successful Kickstarters (Veranthea Codex, Hypercorps 2099, and Mists of Akuma) – how important has Kickstarter been to your development as a game designer and what role do you see it playing in your career moving forward? There would be no proper setting books for my worlds without Kickstarter—Veranthea was already on the way with my first published adventure (The Clockwork Wonders of Brandlehill), but Hypercorps 2099 and Mists of Akuma were created with crowdfunding in mind. At this point I think we can confidently say that I know what I’m doing with Kickstarters and you should expect to see more of them from me in the future, although the things coming down the line might not be exclusively for tabletop RPGs (the next Kickstarter, a quick two week project in July for the Veranthea Collection, being the soonest exception). Rebellion is something I’ve got a notorious soft spot for, but I work in parody, satire (usually of the hyperbolic variety), and subversion into a lot of what I design; the best lies have a ring of truth to them, and while on the whole stories are much more complicated, ultimately fiction is the same way. We’ve been joking in the Veranthea crew about how prophetic Goblinvania is turning out to be (there’s an egotistical orange maniac running the dieselpunk continent), and Cleveland 2099 is as decayed and desolate as Pittsburgh’s rival is in my mind. Historical context is also very important to me and that seems to resonate. 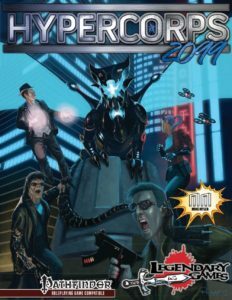 Reviews thus far on Hypercorps 2099 have praised how well we integrated the fictional elements of the world into Earth’s literal past, and for Mists of Akuma we’re drawing an enormous amount of inspiration from ancient Japan (taking events that really happened and reworking them in new and interesting ways). Beyond that we’re probably looking at my own skepticisms and criticisms of the world, and after taking a very brief but critical look at the motivations and underpinning themes of the gods in Veranthea (in Radical Pantheon) I’ve become wary looking too deeply into that mirror—sometimes I intend to write truths into my work because I think that makes them an easier target for suspension of disbelief, but not always (and even then, sometimes unintentionally). 1) Write every day. Every single day. Yes, even then. Then too. Every. Day. 2) Don’t be discouraged by a low rate—everyone starts somewhere. Write for free if the payoff is worth it (I’m a great example of that being true, but I’m an exception in that regard and most of the time, you will get shafted) but remain wary of content farms. It’s really hard swallowing a 1 cent/word rate, but the fact of the matter is that unless you’ve won a contest or placed in RPG Superstar, you’re probably going to face just that. Because of how grueling it can be to break into the industry via the grind, I set a word/rate limit for myself—7,000 words at 1 cent isn’t a very good deal, but for the first time I write for you? Sure. Just this once. A week later (sometimes less) when you’re sitting on my first draft, maps and all, we’ll know why the rate will be higher next time. Until you’re a known entity, that’s the word of the day; you can enjoy a livable wage farther down the road when the Publications Sheet in your resume is more robust. 3) Get known. Use social media. Get a Google+ page, a Twitter account, a Facebook account, get on Skillpages, start a profile on LinkedIn, make your own website—show that you have initiative, that you are active, and that you are definitely leaving a mark. 4) Invest in yourself. Be that with cash, time, or both—release your own products (it’s not hard to get a compatibility license, or to follow the rules for its use) and treat every single job like your first. 5) Be ready to learn that you are not always right and to amend your mistakes. Absolutely! 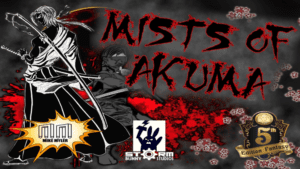 Right now I’m focusing on finishing material for Mists of Akuma, an eastern fantasy noir steampunk campaign setting for Dungeons & Dragons 5th Edition. Most of my work as a designer is already done (barring the chapter on Nagabuki and the copy for ten or so of the major clans), and it’s a waiting game for my writers to turn in their drafts and my artists to get their illustrations done. I think we’re actually ahead of schedule right now and should be in layout by next month. 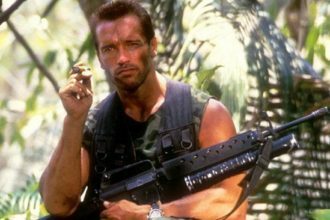 I have an even darker and dare I say more vile project in the works with a publisher I am extremely comfortable with but nobody has signed anything yet, we’ve just set the proverbial dominoes up. If you want to know more or help that get off the ground, become a member of the EN5ider Patreon and tell your friends to do the same! 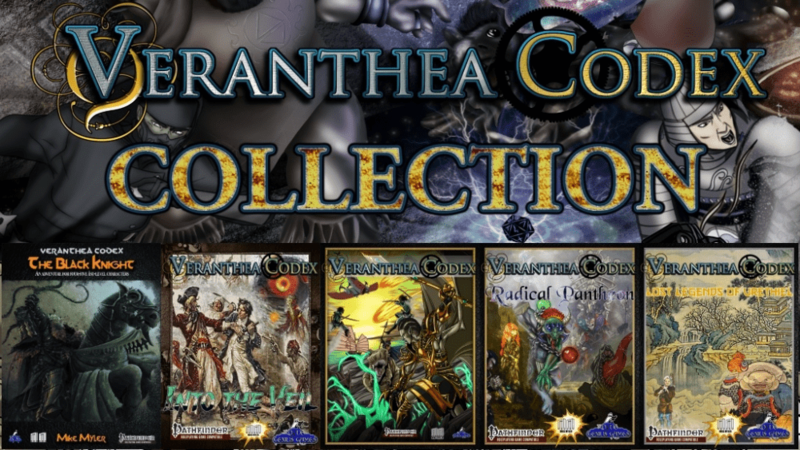 I’m also currently running a kickstarter for the Veranthea Codex collection – you can learn more here. You can learn more about me and my projects here.